Dean Martin ... Slim Moseley Jr. / Slim Moseley Sr.
Jerry Lewis ... Wade Kingsley Jr. / Wade Kingsley Sr. Slim Mosely Jr.: [to Wade Jr] Wade Kingsley Junior? That's what they mean by a family skeleton, huh? 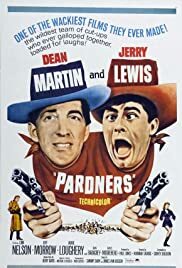 Martin and Lewis are seen as old men in the beginning of the film.They are these ranch partners who are brutally murdered.Their sons ought to revenge for their death.In 1910 their sons are fully grown men, at least Martin's character Slim Mosely Jr. is.Lewis' Wade Kingsley Jr. is a rich momma's boy.But together they head back for the old west where they meet a gang of outlaws called "masked raiders".Norman Taurog is the director and Sidney Sheldon is behind the screenplay of Pardners (1956).It's a western comedy that stars the comedy team Dean Martin and Jerry Lewis.Actually this was the second last picture they made together before their break-up.The collaboration between them still works even though this isn't the best picture they did together.But still pretty funny.Just watch Jerry Lewis learn how to be a real cowboy.And how he's in the saloon acting tougher than he actually is.The rest of the cast does good job, too.Lori Nelson plays Carol Kingsley.Agnes Moorehead is Mrs.Matilda Kingsley.Jeff Morrow plays Pete Rio and John Baragrey is Dan/Sam Hollis.Lon Chaney Jr. is Whitey.Lee Van Cleef plays Gus while Jack Elam is Pete.I became an admirer of Jerry Lewis movies, with and without Dean 10 years ago.They showed all these great and funny movies during the summer that made me laugh.Lewis and Martin worked great together.Just like Laurel and Hardy did, or Hope and Crosby and the Marx brothers.What ever happened to great comedy teams?